Mostly silent. Courting males, rolling croak. Description: White crest bordered in black. 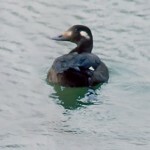 Black back with black bars extending onto white breast. Cinnamon flanks. Thin, black bill. Female, bushy brown crest. Brown body with black back. Upper mandible dark, lower mandible yellowish. Food: Eats a variety of small aquatic invertebrates, also frogs and newts. 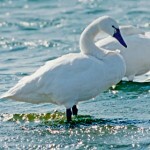 Habitat: Migrants can be found on clear rivers, lakes, and deeper marshes. Will breed on rivers, creeks, and oxbows surrounded by woods. Prefer bodies of water with healthy populations of fish. 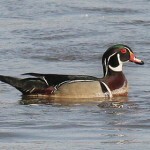 Where in Nebraska: Uncommon to occasional spring and fall migrant, usually in eastern part of Nebraska. Will occasionally summer in the state. No present evidence of breeding. 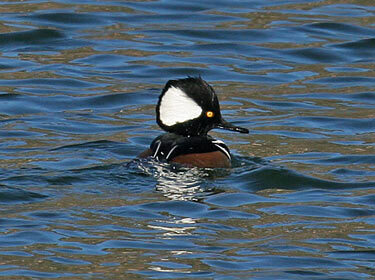 Fun Facts: Hooded Mergansers cavity nests in trees. Nests typically have less than 14 eggs, but have been found with up to 44 eggs. That large number is probably due to more than one female laying eggs in the same nest.